Someone tell me I’m wrong?!! On the PH chart, nutritions are active if the PH range is in correct range for that nutrition...right? I mean if PH was 10.5 there won’t be no phosphorus and this is called a black out, anyway you get my drift. am I wrong to say that calcium and magnesium ONLY start to work if PH is at LEAST 5.8??? I’ve seen and read this everywhere. lets say I’m right here .. then why do brands like snoops premium nutrients recommended ph from 5.3 to a max of 5.8. That’s just laughable! Also, get this .. start A&B contains both traces of calcium and magnesium so what on the earth is this PH rubbish? Nothing on on the internet makes any sense and all nutrient brand are just full of absolute bullsh*t! have a look at the snoop doggy dogs grow guidance it makes no sense and basically does the complete opposite as what PH charts say. You trying to advertise for the doggy dog? Very much doubt it when all I’m doing is slagging it off. Try a known brand. I use Dutch pro, but there's Canna, Growers Ark , Ionic , Plant Magic and many other reputable brands to choose from. Leave snoopy to sing on pop music. I'm using Canna Coco nutes in my first (clay pebble) Hydro grow and that also says pH to 5.2 so I think this is a fair OP (not spam as far as I'm concerned). Does the below graphic help (that was the first I found when searching the site for images; it might not be specific to hydro but it should be thereabouts)? 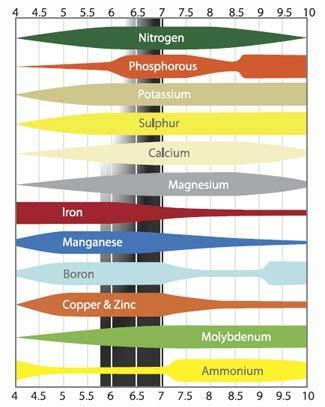 e2a: I think in soil things get buffered so naturally the ph\absorption of those elements increases with time. With Hydro I presume we have a greater degree of control so perhaps we're better off adjusting the pH accordingly throughout the grow cycle (and largely ignore what it says on the bottle, trust your nose\eyes and ignore their cautionary advise). As I say, I'm new to Hydro so hopefully someone will come along and give a categorical reply.